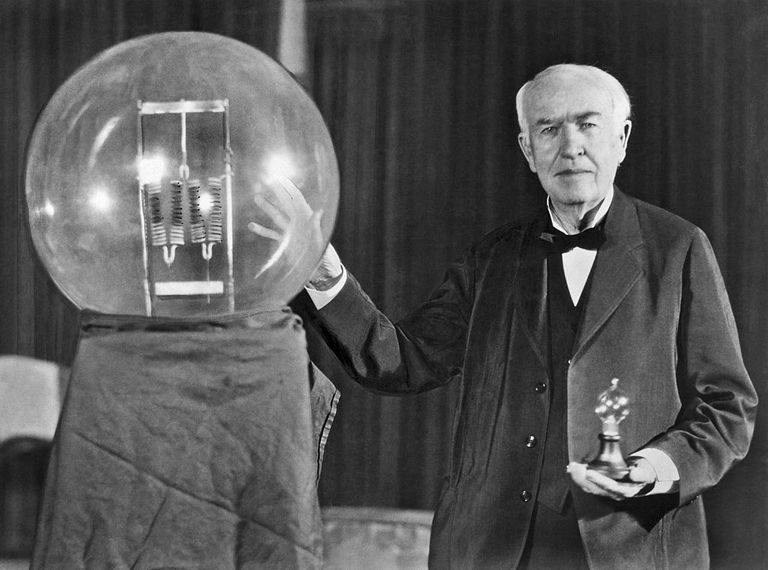 Thomas Alva Edison (February 11, 1847–October 18, 1931) was an inventor, but more than that he was a showman, a celebrity who made the process of invention a fascination for the American public. His contributions to many different inventions were by and large joint discoveries, based on generations of previous work, as well as the work of his gifted assistants and accomplished competitors. He no less than the face of the future, technology, and progress in the late nineteenth and early twentieth centuries. Known For: Inventor, patent holder, celebrity. Born: February 11, 1847, in Milan, Ohio. Parents: Sam Edison Jr. and Nancy Elliott Edison. Died: October 18, 1931, West Orange, New Jersey. Education: 3 months of formal education, then he was home schooled by his mother until the age of 12. Published Works: Quadruplex telegraph, phonograph, unbreakable cylinder record called the "Blue Ambersol", electric pen, a version of the incandescent lightbulb and an integrated system to run it, motion picture camera called a kinetograph. Spouse(s): Mary Stilwell, Mina Miller. Children: Marion Estelle, Thomas Jr., William Leslie by Mary Stilwell; and Madeleine, Charles, and Theodore Miller by Mina Miller. Thomas Alva Edison was born to Sam and Nancy on February 11, 1847, in Milan, Ohio, the son of a Canadian refugee and his schoolteacher wife. Edison's mother, Nancy Elliott, a school teacher, was originally from New York until her family moved to Vienna, Canada, where she met Sam Edison, Jr., whom she later married. Sam was the descendant of British loyalists who fled to Canada at the end of the American revolution, but when he became involved in an unsuccessful revolt in Ontario in the 1830s he was forced to flee to the United States, and in 1839 they made their home in Ohio. The family moved to Port Huron, Michigan, in 1854, where Sam worked in the lumber business. Known as "Al" in his youth, Edison was the youngest of seven children, four of whom survived to adulthood, and all of them were in their teens when Edison was born. Edison tended to be in poor health when young, and he was a poor student. When a schoolmaster called Edison "addled," or slow, his furious mother took him out of the school and proceeded to teach him at home. Edison said many years later, "My mother was the making of me. She was so true, so sure of me, and I felt I had someone to live for, someone I must not disappoint." At an early age, he showed a fascination for mechanical things and chemical experiments. In 1859, at the age of 12, Edison took a job selling newspapers and candy on the Grand Trunk Railroad to Detroit. He started two businesses in Port Huron, a newsstand and a fresh produce stand and finagled free or very low-cost trade and transport in the train. In the baggage car, he set up a laboratory for his chemistry experiments and a printing press, where he started the "Grand Trunk Herald," the first newspaper published on a train. An accidental fire forced him to stop his experiments on board. Around the age of twelve, Edison lost almost all his hearing. There are several theories as to what caused his hearing loss. Some attribute it to the aftereffects of scarlet fever which he had as a child. Others blame it on a conductor boxing his ears after Edison caused a fire in the baggage car, an incident which Edison claimed never happened. Edison himself blamed it on an incident in which he was grabbed by his ears and lifted to a train. He did not let his disability discourage him, however, and often treated it as an asset since it made it easier for him to concentrate on his experiments and research. Undoubtedly, though, his deafness made him more solitary and shy in dealings with others. In 1868, Edison moved to Boston where he worked in the Western Union office and worked even more on inventing things. In January 1869 Edison resigned his job, intending to devote himself full time to inventing things. His first invention to receive a patent was the electric vote recorder, in June 1869. Daunted by politicians' reluctance to use the machine, he decided that in the future he would not waste time inventing things that no one wanted. Edison moved to New York City in the middle of 1869. A friend, Franklin L. Pope, allowed Edison to sleep in a room at Samuel Laws' Gold Indicator Company where he was employed. When Edison managed to fix a broken machine there, he was hired to maintain and improve the printer machines. During the next period of his life, Edison became involved in multiple projects and partnerships dealing with the telegraph. In October 1869, Edison joined with Franklin L. Pope and James Ashley to form the organization Pope, Edison and Co. They advertised themselves as electrical engineers and constructors of electrical devices. Edison received several patents for improvements to the telegraph. The partnership merged with the Gold and Stock Telegraph Co. in 1870. Edison also established the Newark Telegraph Works in Newark, NJ, with William Unger to manufacture stock printers. He formed the American Telegraph Works to work on developing an automatic telegraph later in the year. In 1874 he began to work on a multiplex telegraphic system for Western Union, ultimately developing a quadruplex telegraph, which could send two messages simultaneously in both directions. When Edison sold his patent rights to the quadruplex to the rival Atlantic & Pacific Telegraph Co., a series of court battles followed in which Western Union won. Besides other telegraph inventions, he also developed an electric pen in 1875. His personal life during this period also brought much change. Edison's mother died in 1871, and later that year, he married a former employee, Mary Stilwell, on Christmas Day. While Edison loved his wife, their relationship was fraught with difficulties, primarily his preoccupation with work and her constant illnesses. Edison would often sleep in the lab and spent much of his time with his male colleagues. Nevertheless, their first child, Marion, was born in February 1873, followed by a son, Thomas, Jr., born on January 1876. Edison nicknamed the two "Dot" and "Dash," referring to telegraphic terms. A third child, William Leslie, was born in October 1878. Mary died in 1884, perhaps of cancer or the morphine prescribed to her to treat it. Edison married again: his second wife was Mina Miller, the daughter of an Ohio industrialist Lewis Miller who founded the Chautauqua Foundation. They married on February 24, 1886 and had three children, Madeleine (born 1888), Charles (1890), and Theodore Miller Edison (1898). Edison opened a new laboratory in Menlo Park, NJ, in 1876. This site later become known as an "invention factory," since they worked on several different inventions at any given time there. Edison would conduct numerous experiments to find answers to problems. He said, "I never quit until I get what I'm after. Negative results are just what I'm after. They are just as valuable to me as positive results." Edison liked to work long hours and expected much from his employees. In 1879, after considerable experimentation and based on seventy years work of several other inventors, Edison invented a carbon filament that would burn for 40 hours—the first practical incandescent light-bulb. While Edison had neglected further work on the phonograph, others had moved forward to improve it. In particular, Chichester Bell and Charles Sumner Tainter developed an improved machine that used a wax cylinder and a floating stylus, which they called a graphophone. They sent representatives to Edison to discuss a possible partnership on the machine, but Edison refused to collaborate with them, feeling that the phonograph was his invention alone. With this competition, Edison was stirred into action and resumed his work on the phonograph in 1887. Edison eventually adopted methods similar to Bell and Tainter's in his phonograph. The phonograph was initially marketed as a business dictation machine. Entrepreneur Jesse H. Lippincott acquired control of most of the phonograph companies, including Edison's, and set up the North American Phonograph Co. in 1888. The business did not prove profitable, and when Lippincott fell ill, Edison took over the management. In 1894, the North American Phonograph Co. went into bankruptcy, a move which allowed Edison to buy back the rights to his invention. In 1896, Edison started the National Phonograph Co. with the intent of making phonographs for home amusement. Over the years, Edison made improvements to the phonograph and to the cylinders which were played on them, the early ones being made of wax. Edison introduced an unbreakable cylinder record, named the Blue Amberol, at roughly the same time he entered the disc phonograph market in 1912. The introduction of an Edison disc was in reaction to the overwhelming popularity of discs on the market in contrast to cylinders. Touted as being superior to the competition's records, the Edison discs were designed to be played only on Edison phonographs and were cut laterally as opposed to vertically. The success of the Edison phonograph business, though, was always hampered by the company's reputation of choosing lower-quality recording acts. In the 1920s, competition from radio caused the business to sour, and the Edison disc business ceased production in 1929. Another Edison interest was an ore milling process that would extract various metals from ore. In 1881, he formed the Edison Ore-Milling Co., but the venture proved fruitless as there was no market for it. In 1887, he returned to the project, thinking that his process could help the mostly depleted Eastern mines compete with the Western ones. In 1889, the New Jersey and Pennsylvania Concentrating Works was formed, and Edison became absorbed by its operations and began to spend much time away from home at the mines in Ogdensburg, New Jersey. Although he invested much money and time into this project, it proved unsuccessful when the market went down, and additional sources of ore in the Midwest were found. In 1888, Edison met Eadweard Muybridge at West Orange and viewed Muybridge's Zoopraxiscope. This machine used a circular disc with still photographs of the successive phases of movement around the circumference to recreate the illusion of movement. Edison declined to work with Muybridge on the device and decided to work on his motion picture camera at his laboratory. As Edison put it in a caveat written the same year, "I am experimenting upon an instrument which does for the eye what the phonograph does for the ear." Kinetoscope parlors opened in New York and soon spread to other major cities during 1894. In 1893, a motion picture studio, later dubbed the Black Maria (the slang name for a police paddy wagon which the studio resembled), was opened at the West Orange complex. Short films were produced using a variety of acts of the day. Edison was reluctant to develop a motion picture projector, feeling that more profit was to be made with the peephole viewers. When Dickson assisted competitors on developing another peephole motion picture device and the eidoscope projection system, later to develop into the Mutoscope, he was fired. Dickson went on to form the American Mutoscope Co. along with Harry Marvin, Herman Casler, and Elias Koopman. Edison subsequently adopted a projector developed by Thomas Armat and Charles Francis Jenkins and renamed it the Vitascope and marketed it under his name. The Vitascope premiered on April 23, 1896, to great acclaim. When Europe became involved in World War I, Edison advised preparedness and felt that technology would be the future of war. He was named the head of the Naval Consulting Board in 1915, an attempt by the government to bring science into its defense program. Although mainly an advisory board, it was instrumental in the formation of a laboratory for the Navy which opened in 1923, although several of Edison's suggestions on the matter were disregarded. During the war, Edison spent much of his time doing naval research, in particular, working on submarine detection, but he felt that the navy was not receptive to many of his inventions and suggestions. Henry Ford, an admirer, and friend of Edison's reconstructed Edison's invention factory as a museum at Greenfield Village, Michigan, which opened during the 50th anniversary of Edison's electric light in 1929. The main celebration of Light's Golden Jubilee, co-hosted by Ford and General Electric, took place in Dearborn along with a huge celebratory dinner in Edison's honor attended by notables such as President Hoover, John D. Rockefeller, Jr., George Eastman, Marie Curie, and Orville Wright. Edison's health, however, had declined to the point that he could not stay for the entire ceremony. Stross, Randall E. "The Wizard of Menlo Park: How Thomas Alva Edison Invented the Modern World." New York: Three Rivers Press, 2007. Print.